Kim Little worked her magic this past weekend against FC Kansas City. She was all over the field and scored the lone goal in Seattle's 1-0 victory and for the second straight week, Little was named NWSL Player of the Week. 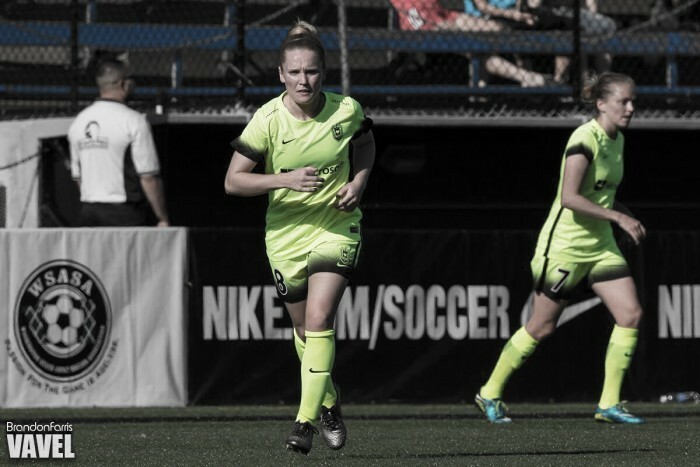 Seattle Reign midfielder Kim Little has done it again. No, she didn’t score another amazing goal or show amazing skill on the ball with multiple players around. Well, actually she did just that this past weekend in Seattle’s game against FC Kansas City. She scored Seattle’s lone goal in their 1-0 win in a rematch of the 2015 NWSL Championship game. For her efforts, she was named NWSL Player of the Week for week three, her second in a row on the young 2016 NWSL season. It should be no surprise at how well Kim Little is at playing soccer. She is arguably one of the best players in all of the NWSL and she was also the best player in the world not that the 2015 FIFA Women’s World Cup. With injuries to Seattle’s midfield, she found herself playing a little deeper than normal against Kansas City. At times, you would see her out at the left or right back positions as she hustled back on defense. At other times, she would essentially be in the center back position clearing balls out of the penalty area. But she was most dangerous in the offensive final third. Little scored the game-winning goal in the 56th minute after she settled a deflected ball from Melon Melis. She took a quick touch with her left foot to get around a defender and fired off a quick shot with her right foot to the left side of the goal. Kansas City goalkeeper, Nicole Barnhart, just stood there and watched the shot go past her. No matter how many times this writer has watched Little play, he always comes away amused at what she can do with the ball at her feet. Sometimes what she does without the ball is even more impressive. This is the second straight week she has been voted NWSL Player of the Week and third time overall in her two-plus years in the NWSL. The 2014 NWSL MVP has been voted NWSL Player of the Month four times in her career. She becomes the 11th player from Seattle to win the Player of the Week award. Hats off to you Kim. Keep dazzling us week in and week out. The NWSL Player of the Week is selected each week of the regular season by the NWSL Media Association, a collection of the press that covers the league on a consistent basis. For more information on the NWSL Media Association.